Three ultra-Orthodox Jewish men have been arrested in Israel, suspected of defacing the national Holocaust memorial with anti-Zionist graffiti. One of the slogans daubed in paint on the walls of the memorial read: "If Hitler had not existed, the Zionists would have invented him." The suspects have admitted vandalising the site, a police spokesman said. Suspicion for the attack had fallen on radical ultra-Orthodox Jews who oppose the creation of the state of Israel. One of the slogans, all in Hebrew, was signed "world ultra-Orthodox Jewry". Another read: "Thanks Hitler for the wonderful Holocaust you organised for us. Only thanks to you we got a state from the UN." A third went: "Honourable government of Poland, stop allowing the Zionists to hold manipulative 'memorial' ceremonies in Auschwitz." Some ultra-Orthodox Jews believe a Jewish state can be established only after the coming of the Messiah, and that the state of Israel is therefore illegitimate. A small number of extremists believe the myth that Israel's founders conspired with Hitler to bring about the Jewish state. 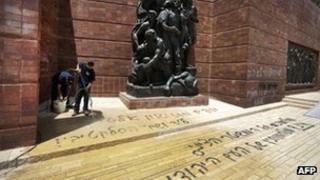 In a statement, Yad Vashem Chairman Avner Shalev said: "I believe that it was important to know the identities of those who spray-painted the graffiti. The suspects are extremist ultra-Orthodox Jews, anti-Zionists, who are on the fringes of society, and do not represent the majority who respect the memory of the Holocaust." Yad Vashem was established in 1953 and commemorates the six million Jews murdered by the Nazis during World War II. The three suspects are to appear before a Jerusalem court later on Tuesday.